As if life wasn't hard enough, it seems that in the Beet universe the Earth has become overrun with monsters known as Vandels who love nothing better than to terrorize good, innocent folk. Thankfully, a group of five warriors (known as Vandel Busters) called the Zenon Warriors are there to protect the hometown of Beet, our main character. I'm not sure what all of the other towns do... or maybe they just don't matter. 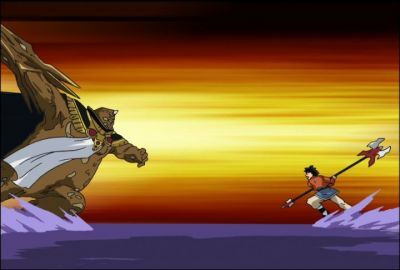 At any rate, Beet is a young boy that dreams of becoming a Vandel Buster, yet the Zenon Warriors always shut him down, saying he's just a kid... which he is. But he's drinking his milk, eating his vegetables, and working out on his Ab-lounger, as he's bound and determined to fight monsters for a living, and "end this century of darkness". Three years later, nobody has seen or heard from Beet. Beet's childhood friend (and possible future wife), Paola, has grown into a Vandel Buster and protects the village. But then a 2-star Vandel called Mugine of the Black Bog starts making life miserable for the townsfolk. Although Paola doesn't quite have what it takes to face off against a 2-star Vandel, she goes for it anyway. I know it's hard to just sit by and not do anything, but c'mon here, who is gonna protect the village if you go and get yourself killed, young lady!? Thankfully, after three years of being off training, Beet decides to come back, and helps her out of the jam. 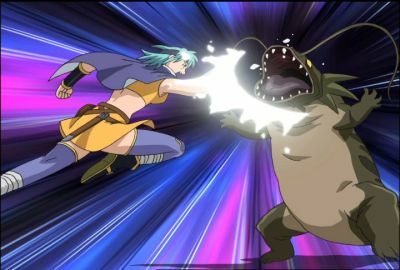 Despite being a lower level Vandel Buster than Paola, Beet makes mincemeat out of the baddies like they were nothing but pesky insects. The artwork and animation seems pretty good for a TV show. 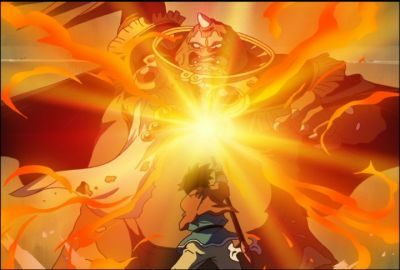 There were a lot of scenes with cool poses and lighting that I thought would make for some cool posters or wall scrolls or desktop wallpapers. I checked out the Illumitoon website but they didn't seem to have any wallpapers available yet. Hopefully that will be coming soon. 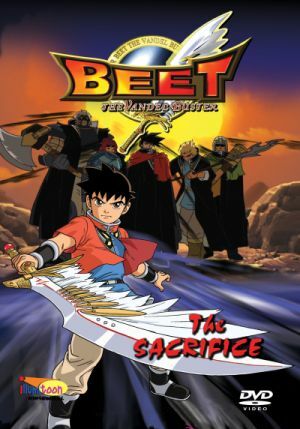 The first DVD release, Beet The Vandel Buster - The Sacrifice , contains the first four episodes in the series ( The Dream Catcher , Sacrifice , Bog of the Dead , and The Burning Lance ), presented in both English and Japanese with optional subtitles. While the English dubbing for some of the characters is pretty good, for other characters it just sounds more like someone trying to do a voice rather than an actual, real voice. Mostly I noticed this about the smaller roles, such as random townsfolk. It kind of reminded me of the old Voltron series. But I also do understand it, as it's not like TV shows have an unlimited budget to work with (although this was released on DVD, it was clearly produced as a TV series). I'm just really glad they were able to include the original Japanese dialog track on the DVD. And both my wife and I are really looking forward to viewing more episodes as to see where this story is going. Illumitoon Entertainment, Ltd. announced that based on overwhelming demand it will be initiating a trade-in program for its "dubtitled" DVDs. 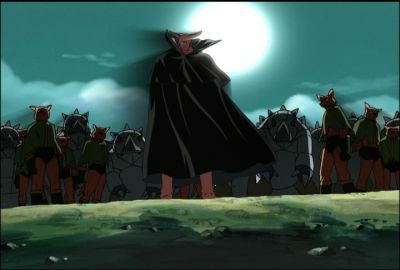 "Dubtitles" are video with the English dialogue superimposed over Japanese audio, as opposed to true Japanese translations of the Japanese audio. "It's something that's obviously very important to the fans, and we want to give them what they want," said Barry Watson, President/CEO of Illumitoon. "Going forward we want to incorporate literal translations on all our anime product." "We're always listening to our fans, and are extremely grateful for their input," said Watson. "I think fans will be very pleased." Illumitoon is offering the trade-in program through 5/30/2007. For more information, visit the company's website at www.illumitoon.com.